Winter in Australia can look very different depending on where you live. 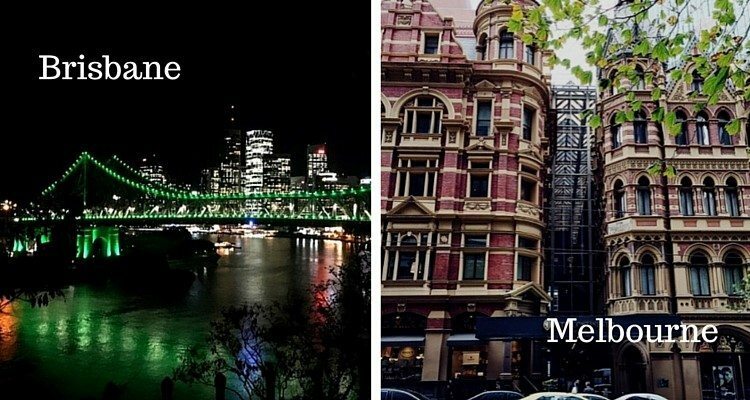 So when discussing Australian winter fashion tips, I thought it would be appropriate to compare two very different cities – Brisbane (in Queensland the sunshine state) versus Melbourne (in beautiful Victoria). I have lived in both places and love them equally, but weather-wise and therefore fashion-wise, there is a stark difference. Winter in Brisbane is very mild with typical daytime temperatures in the low to mid twenties (celsius) and the more north you go, the warmer it gets as you pass through the beautiful Queensland tropical coastline. So light layering is the way to go and repurposing some summer or mid-season fashion is a great alternative. 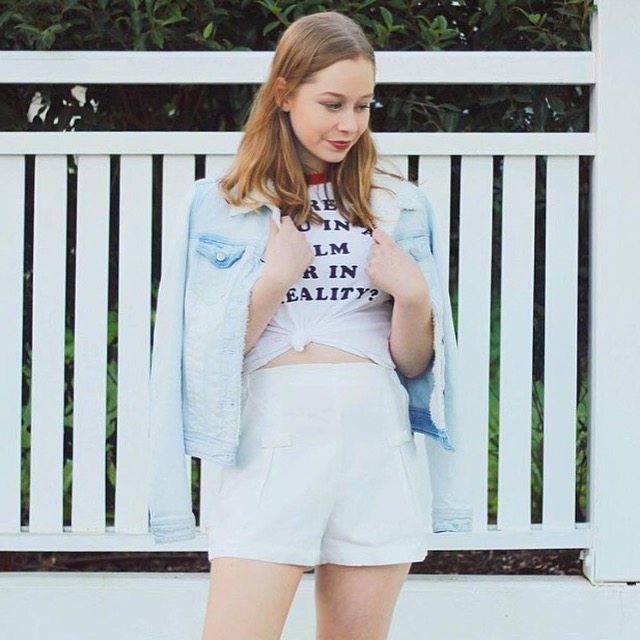 Brisbane-based fashion blogger, Kate Nutting (Pretty Dresses in the Laundry), shows us some great styling tips on how to convert your favourite summer outfits to suit the Queensland winter. Just a few new basics can extend your winter wardrobe – a lightweight jacket in denim is a great start, it goes with everything and looks fabulous with prints. For those cooler days, you can also layer strappy or sleeveless tops and dresses with a plain skivvy top. 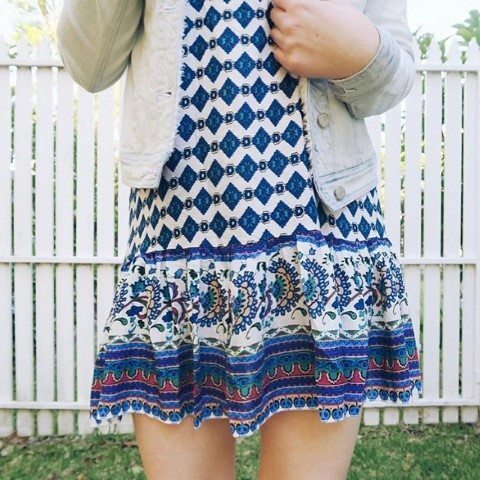 How cool does this Forget Henry Boho Print Dress look? 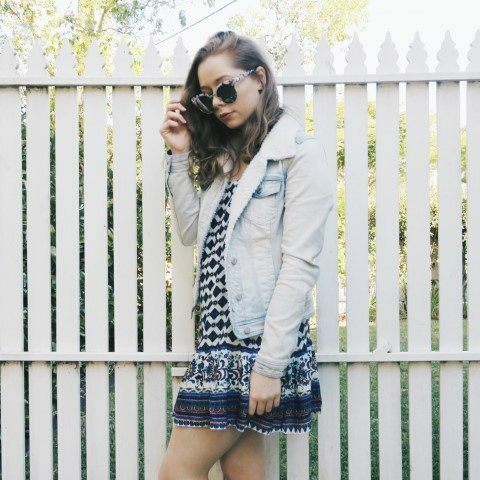 Just throw on a light coloured denim jacket and you are good to go! And who says shorts are just for summer? Our Tanee Clothing Pleat Shorts teamed with a t-shirt and denim jacket look just fabulous for the cooler weather in Brisbane. Kate is also looking super cute in our Tanee Check It Out Playsuit which she has teamed with a playful casual sweater. What about some boho chic styling? 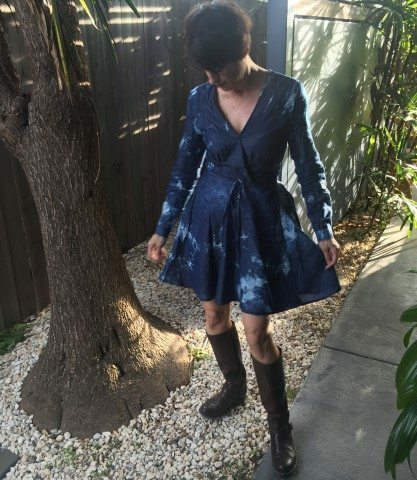 This Rosebullet Tie Dye Wrap Dress is a great option for a mild winter fashion look. Pair with your favourite tan boots for a stylish touch. Looking for something a little more classic? 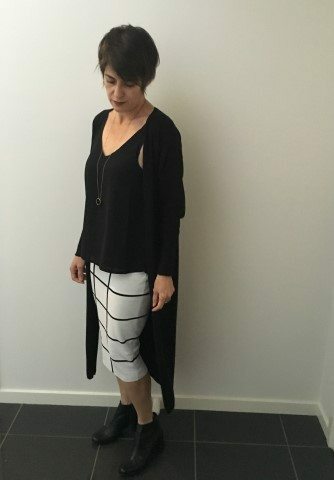 The combination of this striking Rosebullet Check Pencil Skirt with the Mika and Gala Black Cami and Ava Long Black Cardigan create a very stylish outfit for a sunny winter’s day in Brisbane. 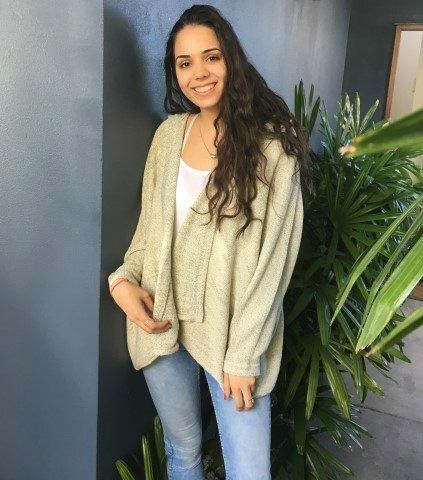 Living in Brisbane also means it’s not all about wearing black – so why not try some winter white with this Wilde Heart Common Ground Cardigan – adds an elegant touch to any outfit. Dressing for a Melbourne winter is all about layering, keeping warm, and looking stylish at the same time. A good starting point is to invest in a great coat. Choose a good quality wool or wool blend – in a colour that will suit your style and wardrobe – you can’t go wrong with the classics – black, grey or beige. If you are a little more adventurous, a bold red coat is a fabulous statement piece. Need some inspiration? View some options here. This season it’s all about great knits and Melbourne is the perfect place to wear them. Beige is the new black so add this Madison Square Knit Dress to your shopping list. This gorgeous dress features a roll neck and comfy knit feel and is perfect for day or night wear. Match with heels or ankle boots for a super stylish look. The roll neck theme continues with this lovely Wilde Heart Knit Jumper – this oversized look knit can be paired with leggings or these Wilde Heart Riptide Khaki Jeans for a great casual look. Layering is the key to staying warm and is perfect for when you reach your destination with central heating or an open fire and need to take some layers off quickly! This Ava Hooded Knit Cardigan is a great option. It’s a super soft knit and its drapey design is easy to wear – perfect for layering and simply match with your favourite jeans. And what about a glamorous look for a special occasion? Even though the colour of choice is normally black in Melbourne town, this gorgeous Sundays Lace Dress is the perfect alternative. Take your favourite coat for travel time and you will turn heads wherever you go. 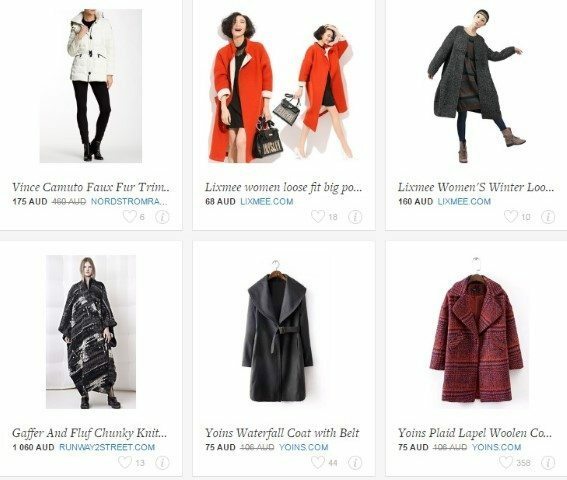 Hope you find our Australian winter fashion tips 2016 useful for this year’s winter styling. Just remember, no matter where you live, with a little imagination and your individual styling finesse , you can look fabulous this winter!